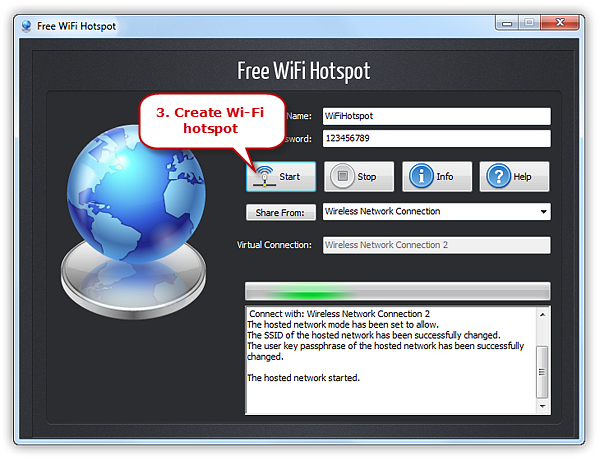 Create free WiFi hotspot to connect with all devices using the best WiFi hotspot creator for Windows. Despite the fact that internet access has become a necessity in our daily life, ensuring all the devices we get have internet connection wherever we go can be a difficult task. Having the internet on all devices is a prerequisite as most devices nowadays come with built-in WiFi feature, sharing the internet via WiFi hotspot is what makes life fun and easier. In such case, the best WiFi hotspot creator, Free WiFi Hotspot, will be a wise choice since it can instantly turn your laptop into a WiFi hotspot access point with just one click. There are many solutions to create WiFi hotspot on the market today, but Free WiFi Hotspot has garnered a good audience due to its performance and a simple interface. It is free to download and allows any nearby or faraway device to access the internet connection available on your laptop. 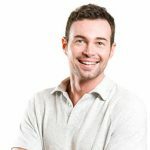 Get All Devices Connected with Free WiFi – you are enabled to share Internet with your iPhone, iPod, iPad, Android phone, PSP, Xbox, Kindle, iWatch, Google Glass and e-readers, external media players, game consoles, etc. Boosted WiFi Signal – it solves your WiFi coverage issue by extending the WiFi range via your laptop so that you can receive WiFi signal wherever you are. Free with Not Any Other Hardware Devices – it requires no purchase of a router or any other hardware to make it work because it’s just a virtual WiFi router that works like a real. Fast create WiFi hotspot to share wireless internet connection with any WiFi enabled devices. 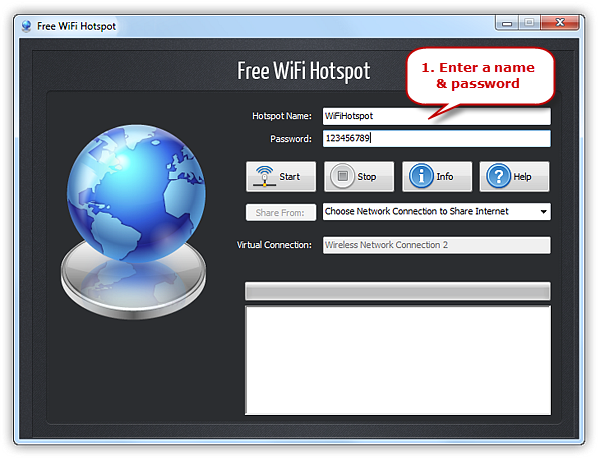 Free WiFi Hotspot, the best WiFi Hotspot Creator, turns your laptop into a WiFi access point with password protection and usage tracking. Thus anyone with any devices nearby can surf the Internet through your sharing. With this WiFi hotspot creator, just join the WiFi, start a hotspot and get all of your devices including your smartphone, tablet, media player, e-reader and other laptops online for free! Why not Other Freeware or Paidware? Some of them may be a little complicated at times especially for beginners; some may require downloading and installation of third party software; some kind of limitations will be found such as 25MB file transfer, 2 computers limitation, no protection and semi-customizable SSID; the installer wraps with a downloader that will install unnecessary ad-ware onto your computer if you’re not careful in opting them out. How to Create Wi-Fi Hotspot on Your Laptop? 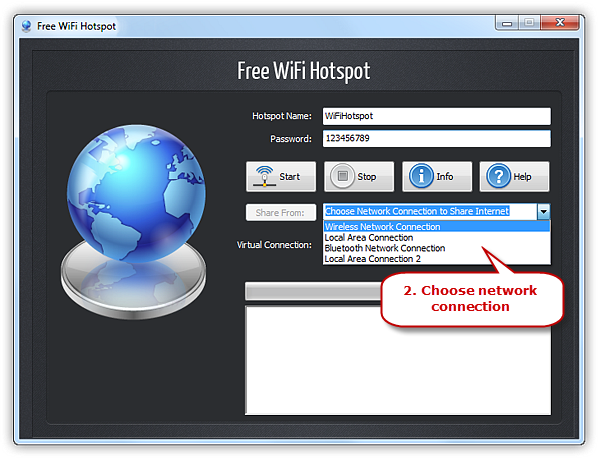 Download and install Free WiFi Hotspot on your PC and the following are some steps to create WiFi hotspot much easier. This app is now working well on all Windows OS versions. The World’s NO.1 Free WiFi Hotspot Creator! This freeware lets you transform your laptop into a virtual WiFi router. Thus you can share the WiFi Internet connection with any WiFi enabled devices.